Wine tasting from this eco-friendly home with stunning views. Three Bedrooms, Two Baths, Covered View Patio and Every Window has a View. Beautiful solar powered home set up for couples who enjoy wine tasting and hosting friends. Yelp shows there are 40 wineries, tasting rooms or vinyard within a ten mile radius of this property. Enjoy a 360 degree stunning view which includes Rattlesnake Mountain, the orchards and vineyards of Benton City, WA, plus the orchards and vineyards of Red Mountain. Interesting wine note: Red Mountain has it's own AVA. Entertain friends on the patio while relaxing in comfortable outdoor chairs. Soak in the beautiful view. Enjoy cooking your meal on the BBQ. Listen to the soothing sound from the disappearing waterfall water feature. Take a stroll and enjoy the desert style landscape viewing sage brush and native plants. Sip your favorite Washington wine on the patio with fantastic view on a sunny afternoon or in front of the wood stove on a cold winter night. This is a beautiful home to visit any time of the year. Flat screen TV's in every bedroom and living room with DirecTV 4K connection. The Installed solar system will generate more power than you will consume during your stay. Free electric vehicle charging in the garage and 50A, 30A x 240VAC RV box outside for your RV needs. James Hendricks is a retired technology teacher from the Tri Cities. He was raised in Spokane, went to college at North Idaho College and Colorado State University on wrestling scholarships. He came to the Tri Cities in 1980 after spending three years as a Peace Corps Volunteer in the West Indies. Jim has had a fantastic career in that he has taught in middle schools, high schools, alternative schools and a STEM school. During his 39 year career, Jim has set up five brand new technology labs and programs for new schools or existing schools that had need. He has won state and national awards for his innovation and interdisciplinary curriculum development. Jim also has spent about 16 summer internship programs at Battelle Northwest National Laboratory in Richland, WA to learn about electronics, robotics and how research and development businesses solve problems. During the summer, Jim loves to camp on his pontoon boat up and down the Snake and Columbia Rivers. During cooler weather, Jim can be found camping along river banks, ocean shores or mountain view points in his motor home. After 39 years of teaching, Jim discovered the new construction home on his way to a meeting in Prosser, WA. Jim fell in love with the property at the first viewing, and bought the house just before spring break in his final year of his award winning career. The summer of 2015 was spent landscaping and development of the house for hosting guests. Jim plans to travel when the house is booked. If you and friends are into wine tasting, you will love to spend a weekend or longer in this home. The house is located near exit 93 on I-82 for convenient travel to more than 40 wineries within a ten mile radius according to Yelp listings. Also 99% of Washington wines are grown on the east side of the Cascade mountains. You will be in the middle of eight AVA/appellations should you stay here. Appellations include Yakima Valley AVA, Rattlesnake Hills, Red Mountain AVA, Walla Walla Valley AVA, Horse Heaven Hills, Wahluke Slope, Snipes Mountain and Natches Heights. All within an hour drive. The most spectacular benefit of this house is the stunning 180 view in the back. It is an excellent place to entertain guests or to relax looking at the view with your favorite glass of wine. The house was built with excellence, high quality appliances and tasteful color scheme. The house recently had installed a 7.8KW solar panel system, that will provide clean electric power to the grid every sunny day. The solar system will generate more power than you will consume during your stay. Free in garage charging for electric vehicles and outside RV box to plug in your RV. Master Bath directly connects to the Mater Bedroom. Inside you will find a large two person shower, and counter with two sinks. Bathroom 2 is a full size bathroom with one sink and bathtub/shower combination. Enjoy rural living on 3.65 acres of native landscape. 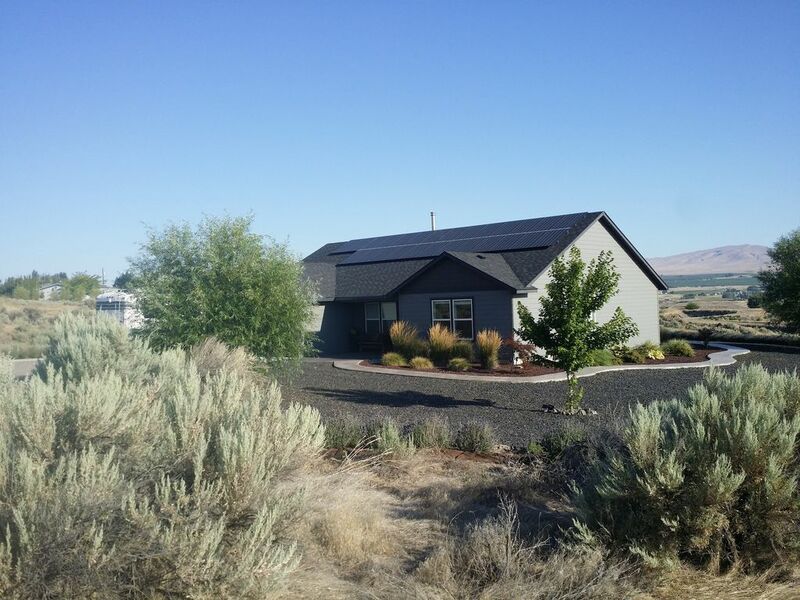 View beautiful orchards and vineyards of the Yakima River Valley from your windows and back patio. The guest is in control of house temperature using a wall mounted thermostat for the electric heat pump. Press "Up" or "Down" arrows to set preferred temperature. The house is maintains a temperature comfortable for the guest using an energy efficient heat pump. Elegant sheets, pillows and comforter are provided for each bed. Samsung front load wash machine available for guests. Please be light on the amount of detergent due to septic system. Samsung clothes dryer available to the guests. Parking for multiple cars or RV available in front of the garage and along the side of the house. 20A 120V circuit available for RV plug in. Garage has room for one to two cars, depending if the owner leaves his car at home during your stay. If you need room for two cars, owner will make arraignments. Free WIFI available for guests. Each bathroom is supplied with four sets of plush towels, hand towels, and wash clothes. Wood stove is a Smart wood stove and has a thermostat on the wall to control the fire. Firewood in the garage. Living room has comfortable seating for six, 65" 4K Smart TV and a view out each window. GE Dishwasher. Please note that this is the best dishwasher I have ever owned!! New Kenmore with ice/crushed ice and water dispenser. Side by side door refrigerator compartment above and pull out freezer drawer at the bottom. GE electric stove with flat ceramic top. GE electric oven with all your favorite functions. Easy and simple to use. GE Microwave about stove top. A ten cup coffee maker available for guest use. One coffee packet available in both caffeine and decaffeinated daily. Feel free to bring your favorite! Coffee grinder available too! Guests have access to upper pantry area. Pantry stores various bowls, dishes, storage containers and other various apparatus to make a full function kitchen for cooking and entertaining. Guests have access to new dish sets that are both functional and decorative. New knife set and multiple cutting boards for preparing a meal or snack after an afternoon of wine tasting. Quality appliances. This room is well designed for cooking and a great place to entertain. The kitchen has its own spectacular view of the Yakima Valley. Glass dining table can easily seat six for dinner. The table comes with four matching chairs and extra chairs are available. Dining area overlooks the Yakima River Valley. Direct TV connected to all TV's All TV's connected to WiFi. Samsung Sound Bar is synced to the 65" 4K TV in the living room. Chess set and table available. Scrabble Checkers Several board games. DVD collection available for use in the Blu Ray player. Blu Ray player is in the Master Bedroom but can be moved to any TV. Beautiful open patio with 180 degree stunning view of distant orchards and vineyards. Disappearing water feature neck deck/patio. Wheel chair accessible from front entrance only. 36 inch wide side walk provides wheelchair accessibility to the back patio area. Everything we needed. Clean, spacious, modern and private. Wonderful house with all the amenities necessary for a comfortable stay. Nicely decorated and well stocked. Loved the spacious back area. Detailed handbook with directions was helpful. TVs were impressive. Kitchen had everything we needed to cook meals. A bottle of wine upon arrival was a nice touch. The owner obviously takes pride in his home and paid attention detail to make his guests comfortable. Fabulous location. Close enough to sample several local wineries. The only thing that would have made it better would have been to have a slow burning log available so we could enjoy the wood burning stove. A little tough to find a night. GPS was off a bit. Really enjoyed our stay. Would be happy to return if we are in the area again. Perfect place for a weekend wine retreat with friends! The owner is responsive. The house is impeccable. The view of the Red Mountain from the patio is glorious! Perfect home base for exploring wine country. Jim provided us with excellent up to date information in regards to the rental. The house is well maintained, clean and up to date. The property is well located to enjoy Washington Wine Country. We really enjoyed our late afternoon and evenings on the patio, taking in the panoramic views and sunsets. If you like great views,privacy and comfort, don’t hesitate to rent this property. Great location, clean, spacious, everything you need! Year #3 and can’t wait to stay again! Girl’s weekend wine trip was super fun, so much that we are hoping to stay another day next year. This place is our favorite in the area. Plenty of room, very clean & Jim is great to communicate with. Always appreciate the complimentary wine & tasting passes. Highly recommended! House is located 12 miles from where the mouth of the Yakima and Snake Rivers enter the mighty Columbia River. Popular place for bass, salmon and sturgeon fishing. Tri Cities Water Follies host the fastest race boats in the world at the Columbia Cup held late each July. When booking, please allow one week notice for house keeping. Home is not suitable for pets. Sorry!